The Decade between 1910 and 1919 was as we all know seriously disrupted by the War and many careers were ruined – even those that were not – eg Duncan McPhee and TR Nicolson – were severely affected and left us asking … “What if ….” or “If only …” All we intend doing here is to summarise the championships and leave the questions to the reader. They are really too big to be tackled in such coverage, Let’s start with 1910. The SAAA Championhips in 1910 were held at Powderhall Grounds, Edinburgh on 25th June, a cloudy day with North-West winds and there was an element of deja-vu about them.. TR Nicolson won both throws for the second time, the hammer by a margin of over 20 feet, RC Duncan went one better than in 1909 when he won both sprints, Burton (880), McPhee (Four Miles), Jack (Ten Miles) and Quinn (Three Miles Walk) repeated their success of the previous year and in the four and ten Jack and McPhee repeated their second places as did Justice in the Walk. Ten men filled the same position as 12 months earlier and to add to the element of familiarity McGough won the Mile again. A few words about some of the winners might be appropriate at this stage. Robert Campbell Duncan was born in Glasgow in 1881 and was a former pupil of Glasgow High School and ran for West of Scotland Harriers. He won the SAAA 100 in both 1909 and 1910, and the 220 in 1910 and 1911; he won the 220 at four Scoto-Irish International matches and is still the only Scot to represent GB in both 100 and 220 at two consecutive Olympic Games in 1908 and 1912. Robert Burton was a member of Berwick and Teviotdale Harriers who won the SAAA half mile in 1908, 1909 and 1910 and won the Irish International in 1910. He set a Scottih half mile record at Celtic Park in August 1910 and went to the Stockholm Olympics in 1912. 100 yards: 1. RC Duncan; 2. G Sandilands. Time: 10.2 seconds. 220 yards: 1. RC Duncan; 2. W Tod. Time: 22.8 sec. Mile: 1. J McGough; 2. DF McNicol. 4:32.8; Four Miles: 1. A McPhee; 2. T Jack. 20:35. Ten Miles*: 1. T Jack; 2. A McPhee. 53:46.4. Three Miles Walk: 1. R Quinn; 2. A Justice. 22:10.4. * Decided on 2nd April at Hawkhill Grounds, Edinburgh. CBP in Three Miles Walk; 220 yards and 120 yards hurdles equals CBP. “Reluctant as we are to admit the fact, it is nonetheless true that in athletics as in other sports,the Anglo-Scot is playing a very important part in making history. Five out of eleven events were captured at Hampden Park by Scots who have gained all their athletic experience in England, and had GRL Anderson and FC Buchanan, both of Oxford University, come north to defend their titles, the number would more than likely have been increased to eight. This is scarcely flattering to home based Scots. Among the any meritorious performances, DF McNicol’s mile in 4 min 26 2-5th sec stands out conspicuously. Considering the weather and track conditions this is a brilliant effort, and we hope that it is bur a prelude to a still greater effort in the English Championships at Stamford Bridge this week. McNicol had to make his own pace after the first quarter or the time, excellent as it is would have been several seconds faster. He is a worthy successor to John McGough whose record of eight victories in ten years will take some beating. The intermediate times in the Mile were:- Quarter 60 seconds; Half mile: 2 min 7 4-5th sec; three quarter: 3 min 20 sec; and mile 4 min 26 2-5th sec. GLC Wallach is another Anglo-Scot who had a comparatively easy win although he did not show up the deficiencies of his contemporaries to the same extent as McNicol. He had a clear lead of 24 yards in the Four Miles over J Duffy of Edinburgh Harriers, but the general impression was that he could greatly have increased his lead if he had liked. Wallach has a great cross-country reputation, but this is the first track title that he has won. The holder, A McPhee, jnr, was ill and could not run. Duffy receives a standard medal as his time was 20 min 46 sec. The Anglo-Scots had much greater difficulty in winning the other events. WA Stewart (London Hospitals AC), for instance, just managed to beat RC Duncan by inches in the 100 yards; there was scarcely daylight between RA Lindsay (Blackheath Harriers) and EA Hunter (Edinburgh University) in the quarter mile, while in the three miles walk the finish in which D Trotter (Ashcombe AC) and R Quinn (Bellahouston Harriers) took part, was extremely close for a competition of the kind. WA Stewart who won the ‘dash’ is a very quick beginner and, paradoxical as it may seem, it is nevertheless a fact that he won the race at the start. RC Duncan, lost it at the starting point, he being slower than usual in getting into his stride. although when he did settle down, if such a term be permissible in this connection, he tore along at a great pace, and with another yard to go might have won. In the 220 yards he ran beautifully and had a clear advantage of three yards over WR Sutherland, the Hawick Rugby player, whose championship debut gave promise of greater things in the near future. …. GRL Anderson’s absence robbed both the quarter and the 120 yards hurdle race of much of their charm. Last year Anderson won the hurdles in 16 sec and the quarter in 53 sec. Lindsay’s win was very popular as he had previously taken part in the 100 and 220 yards without success – he declared he was “bored” in the latter and was on the point of lodging a protest. The half-mile was not the great race that had been expected. It was handsomely won by JT Soutter (Aberdeen University) in 2 min 00 1-5th sec. Burton the holder did not run with the wisdom he sometimes displays or he would never have allowed Soutter to get so far ahead. However he had been taught a salutary lesson from which he will doubtless profit. Even in the quarter mile the ex-champion was a little disappointing. the first four in the 100 yards were from London Hospital AC, West of Scotland Harriers, Edinburgh Harriers, and Blackheath Harriers. all first four in the 220 yards, 880 yards, high jump, broad Jump, were from Scotland. Although there were some Anglos in the heats who did not make it through to the finals, the numbers hardly seem excessive. It is maybe the refrain that the good ones come up and win titles but are never seen up here at any other time. The team for the Irish International contained 23 athletes of whom 5 were from English bases and Brock (India) and MN McInnes (Johannesburg Wanderers) were Scots who had been very active athletes before going abroad. * Decided on 7th April, Hampden Park. 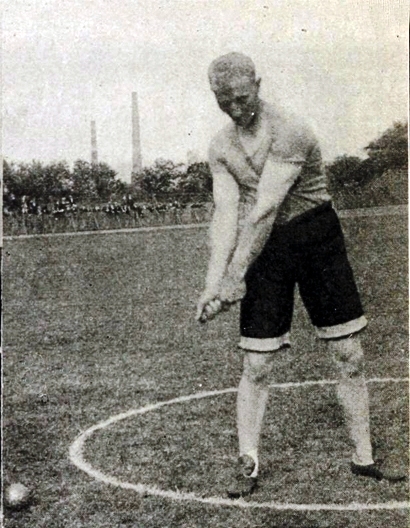 Glasgow provided drier weather for the 1912 Championships, held this time at Ibrox Park on 15th June where there were four double event winners – Stewart in both short sprints, Soutter in the 440 and 880, Jack in the four and ten miles events and, inevitably, Nicolson in the throws. “There have been better championship meetings than the one at Ibrox Park on Saturday, and there have been worse, if that is any consolation to the Scottish Amateur Athletic Association. Nothing of a striking character was, in fact, developed in any of the events. There were no records nor anything approaching record making, and the public were in consequence perhaps less appreciative than they generally are at these functions. Allowance must of course made for the atmospheric conditions, which were of a slightly depressing nature, while the cinder path, soaked as it was owing to the overnight rains, was not conducive to speedy racing, and, to make matters worse, there was a troublesome breeze. Taking all things into account therefore the day was the reverse of ideal for championship requirements. The two short distances were captured by WA Stewart, who made his debut at Hampden Park 12 months ago, winning on that occasion the only race in which he had entered. In the interval the London man has cultivated the furlong and it was patent from the comfortable way in which he beat the holder, RC Duncan, that he has made the most of the interval since the last Scottish championships. Considerable interest was taken in HM Macintosh’s sprinting for two reasons – first because he is an old Scotch Public School boy; and second because only a week ago he was unanimously chosen by the AAA to represent Great Britain at the Olympic Games. Macintosh, in a word, confirmed all that has been written about him in English University publications. He was only inches behind Stewart in the final of the 100 yards, the time for which was only a yard worse than “evens” which is excellent travelling. About the same size as JB Sweet of Glasgow University, the old Glenalmond boy is a very neat sprinter and has a vigorous finish. Another double winner in the flat events was JT Soutter of Aberdeen University AAA. He had the better of R Burton for once in tactics in the half mile, while in the quarter-mile he ran the most “brainy” race that stands to his credit. Burton, it appears, had been off-colour all week, and it is just possible that on that account Soutter had an easier task than he might otherwise have had. All the same the Aberdonian scored two very popular victories. The third double winner was TR Nicolson, West of Scotland Harriers, who won both Hammer and Weight. This, however, is no novel experience for that accomplished athlete. His powers are as virile as ever , and there is no athlete anywhere who can show a record of championship successes like that of the Kyles amateur. T Jack, President of the SAAA, signalised his reign of office by winning the four miles in brilliant fashion. This is the second time he has won this event, the first being in 1908 when his time was 21 min 52 2-5th sec. Jack, it should be mentioned, was reluctant to turn out on Saturday, and it was only on the pressure of his friends that he did so. 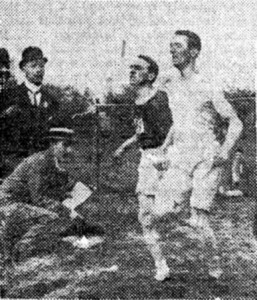 David Trotter won the Walk for the second time and a similar distinction fell to DF McNicol in the Mile, one of the features of which was the finishing sprint of J McFarlane, of Glasgow University, whose form in this event was a revelation to many. The jumps were not particularly good. JHD Watson fouled his best effort, 22′, and with a sounder “take-off” it is just possible D Campbell would have cleared more than 5′ 8″. The absence of GRL Anderson of Oxford University in the 120 yards hurdles race was a source of keen regret, for it had been fully expected that he would have given historic significance to this meeting by lowering the existing record. 440 yards: 1. JT Soutter; 2. RA Lindsay. Time: 51.8. 880 yards: 1. JT Soutter; 2. R Burton. 2:01,8. Mile: 1. DF McNicol; 2. J McFarlane. 4:31.8. Four Miles: 1. T Jack; 2. GCL Wallach. 20:45. 120 yards hurdles: 1. IA Clarke; 2. W Weir. Time: 17 seconds. Putting the Weight: 1. TR Nicolson; 2. K Maclennan. Distance: 42′ 2″; Throwing the Hammer: 1. TR Nicolson; 2. D Rose. Distance: 158′ 3″. * Decided on 6th April at Hawkhill Grounds, Edinburgh. The 1913 championships were held in Glasgow for the third successive year – and at the third ground in the time as well. They were hosted by Celtic Park on 28th June with weather at least dry – cloudy with a strong west win read the report. Nicolson was again in action with two doubles, as was GCL Wallach. Nicolson and DG Campbell (high jump) were the only men to retain their titles. There was a new event – the Tug-of-War which was won by St Rollox Surfacemen’s AC when no other team entered. How do you win a tug o’war when you are the only team? The equivalent of a walk-over on the track, I assume. It was on the programme the following year when at least two teams took part. “As a result of the 31st annual championship meeting of the Scottish Amateur Athletic Association at Celtic Park, Glasgow, nine of the twelve honours changed hands, only the high jump and the two heavy events being retained by the previous holders. WA Stewart, the holder of the 100 and 220 yards championships, elected to remain in London for the London Athletic Club’s meeting, and the other absent champions were T Jack, President of the SAAA, who has retired from the track, holder of the four miles, and JT Soutter of Aberdeen University AA, the quarter and half mile champion. In throwing the hammer and putting the weight TR Nicolson had no difficulty in retaining his titles and it is recalled that his first Scottish championship was won (in the former event) on the last occasion when the championship was held at Celtic Park in 1902. His consistency and superiority are shown by the fact that he has held the hammer championship ever since, and that he won the weight for the eighth time on Saturday. Perhaps the most remarkable incidents of the meeting were the victories over the holders of the mile and the three miles walk by Duncan McPhee and Alex Justice respectively. McPhee is a young runner who has recently come to the front, while Justice has gained his ambition after many years of non-success. 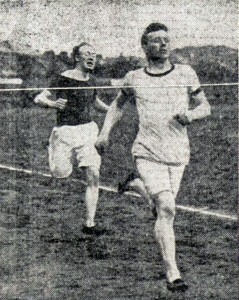 In the absence of the holder it became obvious in the heats of the 100 that it would be won by HM Macintosh of Cambridge University. Although at the time he was less than a yard ahead of JSG Collie of Aberdeen University AA he was so strong and fresh as to justify expectations of his eventual victory; but in the final he was hard pushed by RC Duncan and WR Sutherland. This race proved to be the best of the day , Macintosh, Sutherland and Duncan running together till within six yards of the tape, when the winner’s reserve power told in his favour, bringing him home a foot in front of Duncan with whom Sutherland just failed to tie. Collie who had run brilliantly in the 100 and 220 yards at Aberdeen a week previously, hardly justified expectations, but his failure was due at least partly to a bad start from which he never recovered; and it is possible that he also suffered from nervousness, knowing that much was expected of him. 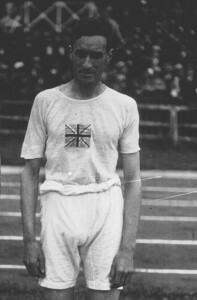 HJ Christie was unfortunate in having to run in Macintosh’s heat, which was won in the fast time of 10 seconds, and he failed to qualify for the final. The 220 yards in which there were only six starters instead of eleven, was also a good race, ending in a win for WR Sutherland. Prominent on the path for several years past, this is Sutherland’s first national honour, although he was runner-up to RC Duncan in the furlong championship two years ago. He was chased home by RA Lindsay of Blackheath Harriers and London Athletic Club who subsequently won the quarter mile in fine style. The hurdle race was somewhat disappointing. Ian A Clarke, the holder, was absent and WL Hunter, Edinburgh University, would probably have won had he not taken the last hurdle too finely when he had a comfortable lead. The finish between Patterson and Weir was very close, but the time, 18 1-5th sec, was slow – the slowest in fact registered in the championships since 1896 , when the race was run against a strong wind whereas on Saturday the breeze was favourable. It should be added however that the times generally were slow on Saturday, the one exception being the 100 yards,w which for the first time in the West of Scotland, was run on cinders. The result of the walk is maybe of some interest. The event was only re-introduced as a championship in 1904 and Robert Quinn made it his own and basically re-wrote the record books for the event. He won the SAAA Championship every year from 1904 to 1910 inclusive with his main rival being Alex Justice of Clydesdale Harriers who was runner-up every year from 1906 to 1910 inclusive – ie five years in succession! In 1912 he was third but in 1913 he finally won for the first time. He was to repeat the feat the following year before the war broke out. A third after the war in the 1919 championships made it two firsts, five silvers and two bronze medals for Alex Justice. * Decided at Celtic Park on 5th April. Also – CBP and Scottish Native Record. In 1914 Powderhall was the venue, 27th June was the date, and the weather on the day was bright with only light winds. The athletes obliged with one Scottish Native Record (broad jump) and four Championship Best Performances. There was a triple winner in WL Hunter who took both jumps and the 120 yards hurdles, Nicolson of course had a double win (what would he have done had there been a discus as well as shot and hammer?) Lindsay won 220 and 440 yards races, McPhee won the half and the mile, and Hunter won both jumps. Five titles went south of the border including all three sprints. “As a result of the 32nd annual meeting of the Scottish Amateur Athletic Association held at Powderhall Grounds in Edinburgh on Saturday seven of the 13 events on the programme changed hands. Six of the previous holders, however, did not defend their titles, the only champion actually beaten during the afternoon being GCL Wallach who in the four miles was obliged to finish second to James Wilson. This number of events mentioned includes, it is necessary to mention, the tug of war. Last year, when this competition was instituted, the St Rollox Surfacemen had a walk-over, the Leith Police AC and FC team failing to appear. On Saturday the latter club, in the absence of the holders, enjoyed the equivalent of a bye in the first round and later defeated the Edinburgh University Irish team by two pulls to nil, after the Western Amateurs had succumbed to the local men by a similar score. In the 100 yards, HM Macintosh, Cambridge University AC, who won the event for the first time at Celtic Park last year, had little difficulty in retaining his title. A close race between Macintosh and JSG Collie of Aberdeen University AA was anticipated, but the Anglo-Scot proved the better runner all the way, finishing almost a yard ahead o Collie. For third place there was a hard struggle between RN Gibson, Edinburgh University AC, and AH Goodwin, Maryhill Harriers, and the officials were reluctant to decide between the pair. The race was run against a strong wind which accounts for the slow time of 10 4-5th seconds, and it is possible that under different weather conditions Collie , who at the Inter-University sports the previous Saturday was returned at 10 1-5th sec, might have done better. Collie defeated Macintosh in the second heat of the 220 yards, but by virtue of being the fastest second in the heats, the 100 yards champion qualified for the final, in which however he could only finish in third place, the race being won by RA Lindsay in the excellent time of 22 4-5th sec. Collie who finished second, had the better of the argument for 200 yards when Lindsay’s staying powers prevailed, the Blackheath and London Scottish man gaining the verdict by half a yard. There were 12 competitors in the quarter mile, which was divided into two heats. Times were slow in both heats the first of which was won by FG Black, a runner who made a favourable impression at Craiglockhart; while the second heat provided an easy win for HJ Christie, Bellahouston Harriers. JM Davie, Stewart’s College, who ran second to Black in the heat, made the pace in the final, being followed by RA Lindsay who was third in his heat. As in the furlong Lindsay proved his powers in the straight, getting home two yards in front of Davie with Black third. Duncan McPhee, West of Scotland Harriers, gained his second Scottish championship in the half mile, in which he was two yards ahead of Ralph Erskine, (Glasgow University AC and Clydesdale Harriers), with another Glasgow runner, G Dallas (Maryhill Harriers) third. DF McNicol, the holder was an absentee and of the 10 programmed runners, only six turned out. At half distance, McPhee , who had led from the start, was displaced by his clubmate W Anderson; but the mile champion stuck close behind and although subsequently challenged by CS Thomas of the the New Zealand AAC and London Athletic Club, he got to the front in the straight, and won as stated. All of the competitors were outside of the standard of 2 min 3 sec, the strong wind accounting for the slow times. The first quarter occupied no less than 65 1-5th sec, the second being done in one minute exactly. 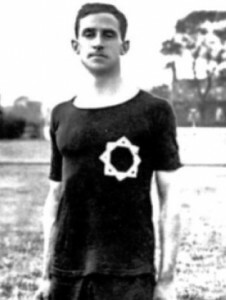 McPhee was again seen at his best in the Mile in which he stalled off the challenge of WM Crabbie, Edinburgh Academicals, and retained his title. Perhaps the most surprising result of the afternoon’s proceedings as that of the four miles race, in which Wallach was unexpectedly beaten by James Wilson. Eleven turned out and the pace was made by Wilson, Wallach following. The champion took the lead at the first mile, and retained the position most of the way. Half a lap from home, Wilson drew level and in a strenuous finish, Wallach found himself unable to hold Wilson, who crossed the tape with a five yard lead. The strong wind told against the pace in the three mile walk, in which Alexander Justice, Clydesdale Harriers, was successful for the second year, and in which he was without a serious rival. At the championship meeting last year, Justice defeated the holder, D Trotter of Ashcombe AC by 25 yards, but on Saturday he had over a lap in hand at the finish. Reference has been made to Henry Maitland Macintosh in 1912, 1913 and 1914 and he had been called the best Scottish sprinter of the immediate pre-war days. Born in Kelso in 1892, the son of an Episcopal clergyman, he went to Glemalmond and the to Corpus Christi College, Cambridge where his running career began to take off.. He won the Freshman’s 100 with 12.8 in 1912 and a year later was elected President of the Cambridge University Athletic Club. He won the Oxford v Cambridge 100 in 1913 as well as the SAAA 100 that year and in 1914. He had run on the Continent in 1913 doing 10.7 and 22.1 in Vienna on 27th July and a few days later ran 9.8 for 100. His really big moment however had been at the Stockholm Olympics on 1912 in which as a member of the GB 4 x 100m team he won a gold medal. He was one of many who failed to survive the war, dying of wounds received in action in July 1918. * Decided on 4th April at Hawkhill Grounds, Ednburgh’; CBP and Scottish Native Record. 120 yards hurdles: CBP – following wind. Many thanks to Alex Wilson for almost all of the photographs on this page.